By Dennis W. Viau; modified from a recipe seen on TV. For this recipe I made my own garganelli pasta. The pasta takes a lot of time to shape. A quick substitute is penne. The sauce starts with a velouté, which is chicken stock thickened with roux, to which is added sautéed mushrooms, onion, and chicken. It is economical and easy to make. This dish was first seen on TV and the cook referred to it as “chicken and fuzi.” I had never heard of a pasta shape called fuzi. It wasn’t until I bought my first pasta book that I recognized the shape as garganelli. Perhaps fuzi was a regional name, or one that was popular only in his family. If using fresh pasta dough, roll the dough and shape the garganelli (see PDF or Pasta From Scratch). Set aside. Heat butter and flour in a medium saucepan until the butter is melted. This is a roux. Cook the roux about 1 minute to eliminate the raw flavor from the flour. Add the chicken stock and bring to a boil to thicken. This is a velouté. Remove from the heat, cover, and set aside. Heat the oil in a skillet over medium heat and sauté the chicken until thoroughly cooked but not browned. Transfer to a bowl and set aside. Wipe the skillet. Add more oil and sauté the sliced mushrooms until tender, about 3 minutes. Transfer to the bowl of chicken and set aside. Sauté the onion until golden, about 20 minutes, reducing the heat as the onions reduce in moisture. Add the garlic and cook a minute longer. Return the chicken and mushrooms to the skillet and add the velouté. Blend and season with salt and pepper. Herbs, such as oregano, can be added if desired. Cover and set aside. Cook the garganelli in boiling water about 1 minute and drain. If using dry penne, cook according to package directions and then drain. 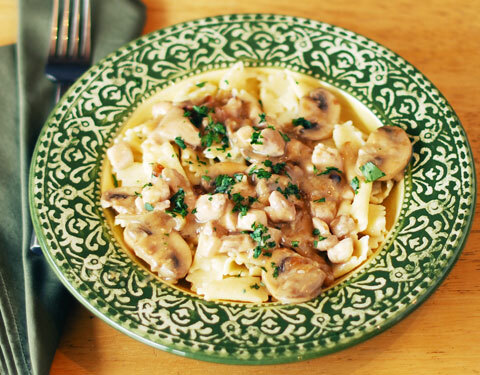 Add the cooked pasta to the skillet of chicken and mushroom sauce. Blend well and heat to serving temperature. Plate and garnish with grated or shredded Parmesan or Romano cheese if desired. Serve with your favorite vegetables.